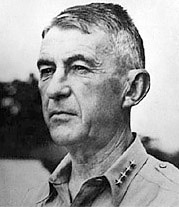 The Alamo Scouts were organized on Fergusson Island, New Guinea, on 28 November 1943 to conduct reconnaissance and raider work in the Southwest Pacific Theater under the personal command of then Lt. General Walter Krueger, Commanding General, Sixth U.S. Army. Named for his beloved association with San Antonio, Texas, and the Alamo, Krueger envisioned that the Alamo Scouts, consisting of small teams of highly trained volunteers, would operate deep behind enemy lines to provide intelligence-gathering and tactical reconnaissance in advance of Sixth U.S. Army landing operations. Members of Rounsaville & Nellist Teams following the successful liberation of Cabanatuan POW camp. Luzon, PI. February 1945. Signal Corps Photo. During these two years the Alamo Scouts liberated 197 Allied prisoners in New Guinea, and provided forward reconnaissance and tactical support of the Sixth Ranger Battalion in the liberation of the Cabanatuan Prisoner of War Camp on Luzon, in February 1945, freeing 511 Allied prisoners. In addition, the Alamo Scouts captured 84 Japanese prisoners of war. The Alamo Scouts evolved from a simple reconnaissance unit in New Guinea to a sophisticated intelligence collection group which supplied and coordinated large-scale guerrilla operations on Leyte and Luzon. 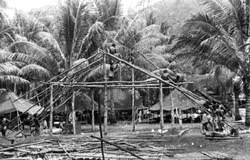 Alamo Scouts Training Center under construction Fergusson Island, New Guinea, December 1943. They were unceremoniously disbanded at Kyoto, Japan, in November 1945, never to be reconstituted. Back row. ASTC staff Mayo Stuntz (L) and Homer Williams (R) with natives near Kalo, Kalo, Fergusson Island, New Guinea. The Alamo Scouts have the finest record of any elite unit of World War II and, arguably, one of the finest in the history of the United States military. In 1988, the Alamo Scouts were individually awarded the SPECIAL FORCES SHOULDER TAB for their services in World War II and included in the lineage of today's U.S. Army Special Forces.